I attended the livestream of Bioware’s Guild Summit and took down some pretty comprehensive notes on everything that was said, hope you find them helpful! We have over 160 guilds represented here at the guild summit with over 9000 live viewing it online. 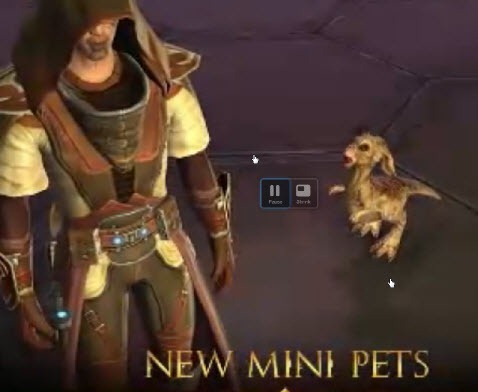 How has SWTOR being doing since launch? Average playtime for players its around 5 hrs a day x 7 days a week – almost a full work week! Friends of Star Wars program: Launching tomorrow (march 6), allow you to invite 3 of your friends to play the game for free for a whole week! James Ohlen promises you that you will never see a free game update this massive in an MMO before. Looting system in normal needs improvements – we wanted to make it pug friendly so you don’t have to yield to someone who is a masterlooter when you are pugging. We will deviate from this auto-assigned loot system in patch 1.2 raid content and use system currently in use for hardmodes/nightmares. Also in the future we will allow you to trade loots assigned to you to other operation members for a limited time (hrs). We know our existing operations are fairly easy, our goal is to make hardmodes and nightmare modes a bit more challenging than they are right now. Something not intended that made certain encounters easier is the fact that armor debuffs from multiple people of the same classes can stack together – this is to be fixed. We are well aware that hardmodes and nightmares give the same amount and quality of loot. It is going to be harder than the current raiding content and will involve a lot more coordination and execution rather than just gear/stat checks. Nightmare mode of Explosive Conflict will not be launched with patch 1.2. It will come after and feature new/additional mechanics on the nightmare difficulty and offer new additional gear tier different from hardmode. We are also renaming the “normal” mode difficulty we have right now to “story” mode to give a better reflection of the difficulty. This is not a mode for guild progression but rather a mode to experience the story and socialize. Bug fixing will be our highest priority. They are enjoyable but we need better endgame progression via flashpoints. We want to smooth the curve to operations. Group finder: introduced in game-update 1.3 – also for heroic quests and flashpoints. It is single server only. We understand that community is very important to our players we want to preserve that. Q: will we see separate lockouts for hardmodes and nightmare with 1.2. A: No, hardmodes and nightmares are progression raids while story mode is more for socializing. Q: 16m and 8m difficulty A: we want them to have the same relative difficulty, we will lower some of the stats on 16m bosses to counter the coordination issue of 16m. More loot in 16m, more bonus loots (mounts, recipes) but same tier of loot. Q: 16m and 8m raid content- same or different? A: 16m and 8m will have the same content for now. Q: Timestamp achivement for boss kills to help foster competition? A: yes that is something we very much do. We love achievements. We want to reward server first kils things etc. These are long term plans, not something in the immediate horizon. Q: No big difference between columi and rakata, bigger gear disparity in the new raid content? A: yes there will be more of a disparity – our earlier goal is to not inflate the stats too much. Tionese to columi has a big jump but the jump from columi to rakata is more something of a prestigious jump. New tier for PVE and PVP coming, it will have more stats that makes sense (i.e. less accuracy). we are opening augments across all gear pieces that supports – so there is a separate system you can use to customize your character. With 1.1.5 we have lightsaber crystals with expertise on it. There is limited PVP crafting. There will also be more disparity between PVP and PVE gear. Q: Threat meters, dps meters – are they coming? what is bioware’s stance? A: we want reliance on in-game visual cues but that is not we say we won’t give you dps and threat meters. We will have them in but just not in 1.2. We you to have control over what other see about your character – we went for the middle ground – in 1.2 you will be able to use a simple input in the chat system to see what defeated you. we also have a very detailed combat log you can write to your disk – someone enterprising can use it for their guild to see their performance but it will be out of game (3rd party). Q: Is craftable gear comparable to endgame PVP/PVE gear? A: yes but we wil deter it to another panel. Q: space missions – interesting but any plans to implant them into flashpoints/operations? A: we have a secret project for space missions in the works right now – can’t give you more details. Q: Enrage mechanics – is that something we will see across the board? It limits the standard build you can take and have guaranteed success. A: intention is that in 8 man you have 2 tanks but that didn’t work out too well. with 1.2 you going need a lot more coordination and even tank-trading. You will need 2 tanks for 1.2 raid content. Q: Lucas style of fighting? players split to do stuff – like 2 guys fighting a sith, 2 guys do something else? A: ancient pylons is something we have tried but it is definitely something we are interested in looking into. Q: 16m intended to be harder than 8m? A: the idea is to keep the difficulty level between the two as close as possible – we will make 16m bosses a bit easier to compensate for the raid coordination in 16m. Q: as an ops leader are we going to get more tools to shift people around in ops groups? A: On the UI panel there is more discussion but yes we want to have more options. Q: ready check system for flashpoints and operations? A: we don’t have a ready check? I am going back to the office and get that in. Q: are we going to implement hardmdoes for flashpoints that currently do not have them? A; yes eventually we will be – can’t say when exactly. Q: you can reverse engineer operation gear – can you get schematics from that? A: yes, we will talk about it later. Q: Flashpoints – another diffculty added to flashpoints A: not in the near future. we will keep adding new flashpoints and the flashpoints are going to get harder. Q: Dynamic style operations? i.e. more open world A: yes in 1.2 we will have more open world bosses. Medal system- not balanced across classes right now. No specific queues for warzones in place but we are allowing same-faction warzones to reduce the number of Huttballs. New Warzone in 1,2: Novare coast: majority control objective – 3 point objective. You need to control at least 2 out of 3 objectives to do damage to fortification. Ranked PVP Pre-season coming with 1.2: Character ratings for both solo and group play based on the ELO system. New Warzone dailies with 1.2 – new dailies requiring winning certain number of medals rather than wins. Something to mention about the medal system – you might have noticed that the objective capture and defend columns are not working right now. This is because we didn’t finish off all the medals we want to have in there. 18 new medals introduced for objectives, participation and performance (i.e. the first to get the datacore, planting a bomb, catching a ball, and scoring in huttball ) – very positive audience reaction. Warzone rewards will be based on earning medals but we also want to discourage farming (i.e. not finishing a match in Huttball when you are 5-0): 1. we are also capping the amount of medals you can get 2, you get more medals for winning a warzone fast. The new cap for the medals is still to be determined – maybe around 8 because we are essentially doubling the amount of medals that are available right now. If you win a warzone fast, you will get a medal for say finishing a warzone in 5 minutes, 6 minutes, 7 mintues, etc. if you win it in 5 minutes you get all the subsequent medals as well. This also encourage the losing team to continue participate in objectives and get more rewards. In patch 1.1.5 we are doing the first step of this by capping it at 4 medals (not introducing the new medals yet) and increasing the amount of rewards per medal. Vote to kick: coming up with patch 1.2. Players can vote inactive players out of the warzone to be replaced by someone else in the queue – we are aware of the potential abuses of the system and working on measures to prevent that. Efforts to combat AFK – needs minimal player contribution to get medals – if you just sit around you not going to get much. Medals will add a modifier to your overall rewards in the warzone. 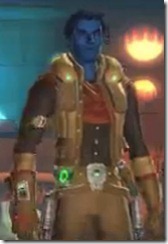 New tier of PVP gear – War Hero. 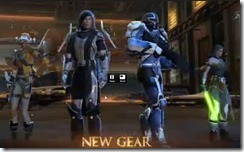 This gear will have a greater stat difference from PVE gear to minimize the cross-over with PVE gear. We don’t want you to use PVP gear to do hardmode flashpoints/operations etc but we don’t want to have the barrier of entry for PVE people to go into PVP to be too high. 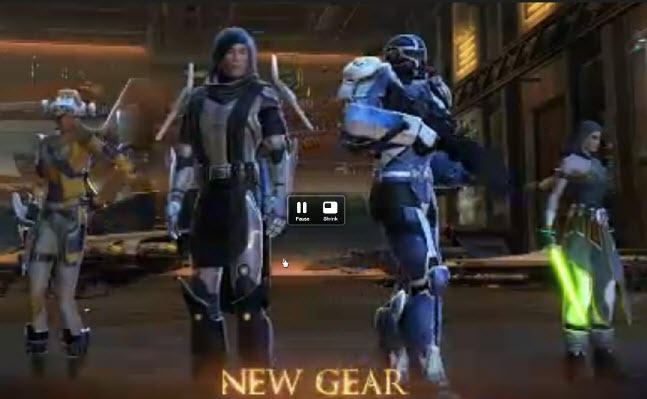 New gear will more lean on expertise and stats that are more PVP focused. New PVP crafting – adding expertise crystals. We are also adding a new entry level PVP gear to people that they can purchase with credits to bridge the barrier from when you hit level 50 and having to combat against Centurion/Champion geared players. This gap between fresh 50s and Centurion/Champion geared players is wider than we intended. War hero gear from ranked warzone commendations. Regular warzone commendations will give you battlemaster gear and entry level PVP gear is going to be champion type level with more focus on expertise so it is not as viable in PVE. Less randomness from rewards for PvP progression – we had a challenge at launch to be able to tier gear like we did with PVE. In PVE you have different tiers of progression content but in PVP its all flat, ranked warzones will allow us to tier PVP content and therefore tier our rewards. Existing warzones will allow for same faction vs faction – training mode scenarios. Schedule for patch 1.2-1.3. Cross server ranked warzone queuing –this is important for competition but at the same time we will still have incentives that lean towards grouping people of the same server. This will leads to more level bracketing with the future possibility of bracketed tournaments. 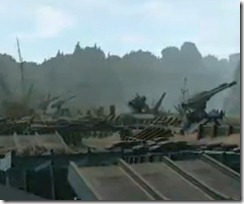 It will also have the ability to choose a specific warzone. Bracketed tournament system – join instantly, once it matches enough teams you can just fight each other and get qualification points for 1st, 2nd, 3rd places etc. We will allow you to queue a full of 8 people together for those ranked warzones and in the future we want to formalize that a bit more with teams. Timeline is TBD. Persisting groups across warzones so you don’t have to reform them between warzones – something we want to add in the future as well. We know they are less popular than warzones. 3x more level 50 warzone players than ilum players – Ilum has some problems! Going back to the drawing board for Ilum – more details later this year. We got a bit too ambitious with ilum – we had some technical difficulties that got in the way of what we wanted to accomplish. Ilum will still be there but just not as incentivzed as much. Redesign Ilum to be more fun and engaging – if it is the right time and right place it is going to be fun – we want to make timed objectives, balancing measures between factions. Removing Ilum PVP quests – rewards being moved to warzones for now. Minor changes to Outlaw den – we want players to get there quick. we will be introducing some quick travel, leaving it as a PvP sandbox. Mirrored classes imbalances – with animation etc. Speed hacking/exploiting – we want to control them before we get to season 1 of ranked warzones.We got multiple teams working in detection and control and also increasing the size of these teams. Patch 1.2 being a pre-season will give us time to catch them. Q: Any plans for just PUGs in normal warzones right now so you don’t have to worry about getting steam-rolled by pre-mades. A: Normal warzones match-making system right now does make an effort to match group vs group – depends on the population and who is queued up and overtime it sort of loses its restrictions. 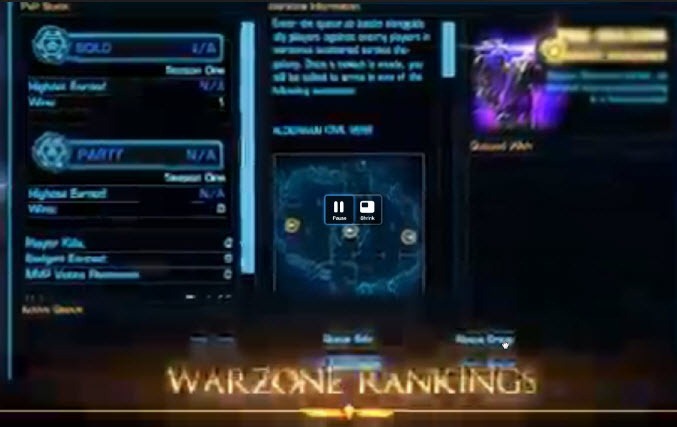 When we get cross-server queues with ranked warzones it will make it prevalent that is group vs group and solo vs solo. Q: With changes to pvp gear – will you also change the diminishing returns on expertise in order to have it go up more? A: all the stat caps have being re-balanced following the introduction of tiers – so yes. Q: Ilum performance issues – issues with Hero engine? A: some of the engine issues don’t show until you go live – a lot of optimization issues with environment (turrets, walkers) in the area. This is something we are removing as part of the optimization. Q: My guild mates were devasted by the removal of Ilum objective based gameplay on Ilum because of trading that were going on. . The new more deathmatch based system just wasn’t the same. Any plans to returns to returns to objectives based system in open world PVP? A: we had issues with the 5 objectives permanently locked to a faction (they are suppose to only lock for a specific amount of time). We weren’t able to do much before the game went live and as such there were trading were going on since these objectives lock permanently unless players changed them. We had to change it to killing for the meantime but it is not our long –term goal. Ilum in the future will be objective focused. Q: pre-forming guilds before game was launched, we had allies and adversaries, any plans to utilize them as part of some in-game functionality? What about bounty offered on players? A: The bounty system is something the PVP team would love to see but we don’t have any definite timeline. We will talk more about allies and adversaries once we get to the guild stuff but it is on our wall of crazy ideas. Q: with pre-formed 8 mans, can we challenge other guilds to a 8vs8 match in a warzone? A: it is something we have designed for – warzone challenges. Not going to be in 1.2 but in the future definitely. Q: we have a few guildies that are battlemaster – are you going to make it less grindy to obtain these gear as right now they are farming daily and weekly quests to get those commendations? A: Right now if you are valor 60, the only way to get BM bags is via quests – winning warzones. This leads to bad behaviors of leaving warzones you are losing. It took away the incentives to get commendations and the incentives to get performance in warzones. In 1.2 the ranked warzone commendations will be used to purchase War hero gear directly (no valor rank or warzone rating required to equip the new War Hero gear) . Warzone rating will allow you to get a different color version of the War Hero gear (its more of a prestige thing, especially in the pre-season). Valor rank requirement for battlemaster gear was a temporary measure – valor rank is suppose a PvP prestige thing and not a gear progression. More valor ranks give you prestige things like being able to be the leader of a warzone, cool mounts etc. Q: I run 24 vs 24 pvp matches in Outlaw Dens. how I am suppose to maintain my large pvp guild if you give us only 8 man content? 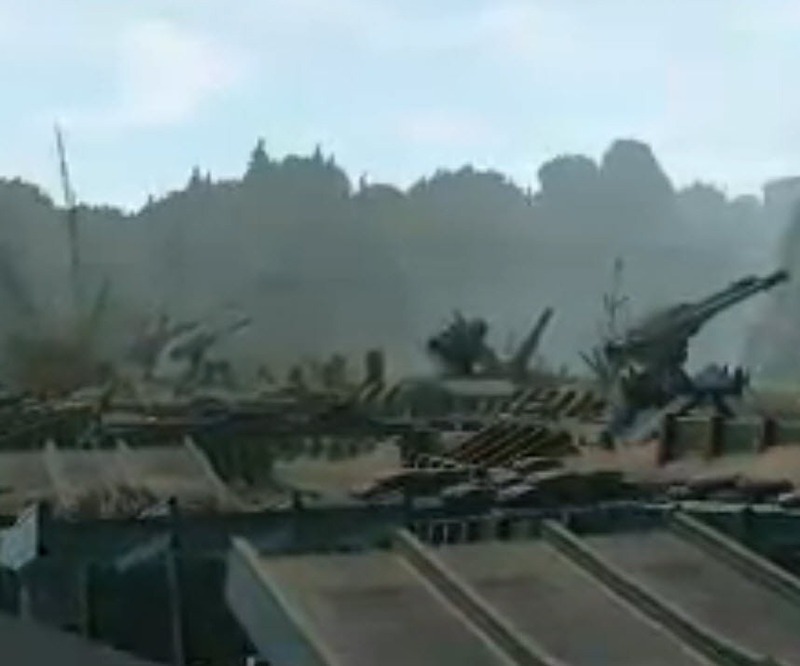 A: large warzone battles is something we want to do in the future but 8 man content is just what we have right now. 8 is a good number in ranked warzones – everyone has a part. We do like to have players get together and have massive battles – this is what Ilum and Outlaw’s Den were originally intended for. We will have more content for larger PvP battles in the future. Q: Current valor system will go away with ranked warzones and become more of a cosmetic thing? What about guild vs guild PVP? A: Guild vs guild pvp will be initially 8 vs 8 premades in ranked warzones and open world pvp in the future. Valor is a recognition of your PvP experience rather than your specific gear progression. Q: As a RPer I don’t like watching someone running circles around me in PvP: Any plans to move away from running around circles? Any plans to be able to face the target you are on? A: auto-facing in PVP – definitely two camps on that. auto-facing we feel diminishing some game mechanics like positioning etc. We are planning to improve PVP animations but auto-facing is not something we want to have. 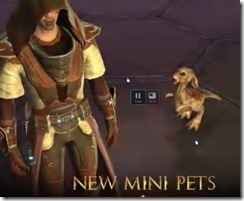 if you have auto-facing it just becomes who has a better command of their rotation – we want PVP to have a bit more dimension than that..Smuggler/agent have auto-facing while in cover. Q: Right now defense/shield/absorb is strong in PVE but nearly useless in PVP- any plans to make those tank stats more useful in PVE? If not any plans to remove these tank stats in favor of more DPS stats? A: As a tank you are vulnerable to force/tech attacks (some sorcs can tear you to shreds) but if you don’t use defense stats are you going to be also vulnerable to highest DPS classes like sentinels/snipers (especially if these guys stack accuracy on their gear). This make you vulnerable essentially to all classes but healers. People have being removing accuracy from their gear which allow tanks to run gear without any defense stats and still get away from it. When we get ranked warzones where people play more aggressively, you are not going to get away from that. With 1.2 there will be some under the hood adjustment to all stats so all theorycrafting will have to be done anyway. Q: There isn’t much to do in PVP once you are done with dailies: any plans to add more than just quests/dailies? A: You are no longer limited by the daily as you can earn ranked warzone commendations nonstop. The focus on daily is going away – they will still be there – you will get a couple of ranked warzone commendations from it. Q: Dynamic events – are there any focus on dynamic PVP events? A: we don’t want give away any of the dynamic event info – we want it to be a surprise. We don’t want you to be able to predict them. Q: can we talk about just running around murdering people? A: its fun – we want to give you a drop list when you kill random players – some kind of mercenary commendations or valor or something else. 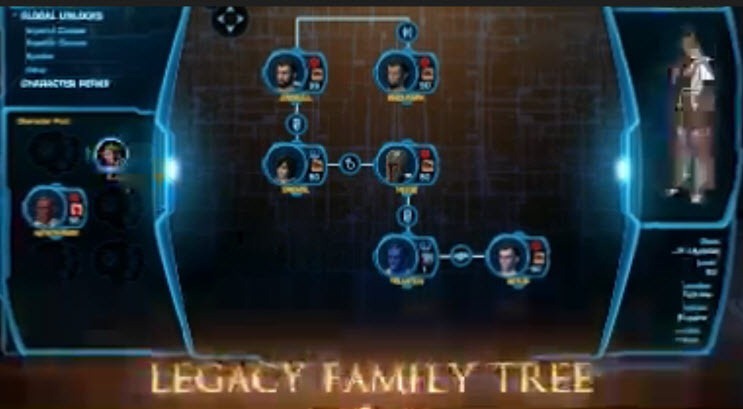 In the very early days of SWTOR – we had a family tree of all the main characters of Star Wars to try show the whole story and how it went through time. This is something we have developed as a labor of love over a number of years. It touches everything we have in the game but we had to pull it back at launch – too risky for launch- it will have to wait. The wait is almost over! Automatically updated with all of your various characters from all of your various different things – decide if they are your allies, kids, wifes/husbands – its super cool roleplaying. Reach level 50 with a human race – gain presence stat on all your existing and new legacy characters (since humans can be all classes). Cyborgs – individual classes have their own individual cyborg attachments – you can now unlock all of them and be a uber cyborg. Complete chapter 3 – unlock heroic abilities for all your legacy chars – these new heroic abilities will require companions to use like the heroic moment abilities you have right now – so you can’t use them in operations. Example of heroic ability: force choke from sith warrior on all your Imperial Agent alt if you complete sith warrior to chap 3. Completing a companion character – complete all missions for that companion – shorter cooldown on heroic abilities, longer duration for heroic moment and unlock small stats boost for first companion of each “type” (i.e. ranged tank) you have unlocked. Additional presence buff for completing additional companions of the same type. 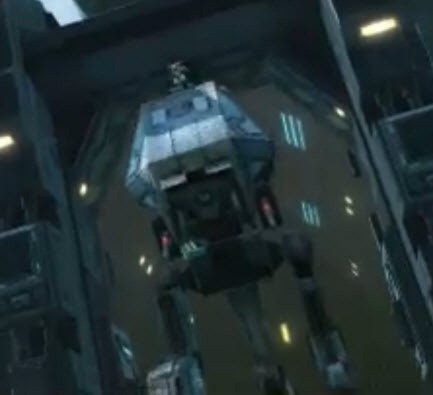 Examples: As a smuggler you complete all the missions for Corso Riggs (ranged tank type) – unlocked shorter cooldown and longer duration for Heroic moment for all legacy characters. Also unlock small accuracy boost for all legacy characters. If you complete all the missions for Risha (ranged DPS) now, you will unlock addiitonal reduction to cooldown and longer duration for Heroic moment for all legacy characters & small critical hit boost for all legacy characters. Social rank unlocks – dance with your companions, new emotes (RP packages – big package of RP emotes). Once 1.2 hits live, we will through your level 50 characters and unlock these heroic abilities – so level yours alts to 50 now! Jetpack – short duration sprint – we moved to sprint to level 1. Jetpack for BHs, rocket boots for everyone else. Items for your ship – training dummies (operation, warzone dummies, healing dummies), repair droid (buy, repair, and sell upgrades for your ship droids that improves specific crafting abilities), mailboxes, auction houses (neutral GTN terminal but very very high up the legacy system – we want fleet to be populated it requires a lot of legacy level and a lot of credits). Legacy weapons and armor – you will get token drops (can be traded for any class) that are bound to your legacy system – bind on legacy – can’t trade with others but you have full mailing options within your legacy. These do not scale with levels. Legacy appearances – unique orange gear only unlocked with legacy levels. Character specific rewards: specific buffs to help your early-game experience for your alts. (i.e. purchase a PvP xp buff for your PvP alt or purchase a speeder license on your low level alt). Customize your gameplay with each of your alts. HUGE REWARDS ASSOCIATED WITH THE LEGACY SYSTEM. 1.2 and 1.3 are huge legacy patches. Q: can I transfer an alt from a different server? A: yes when character servers come, which is not in the immediate future – these alts will meld together and you will get higher of the two legacy levels. Q: can I share legacy with other players? A: it is a one of our dev’s biggest pet project – we do not have a plan where we know how to make that yet but we have a lot of hopes for it. Q: can you change the race of a previous alt when you unlock a new race? A: no you need to make a new alt. 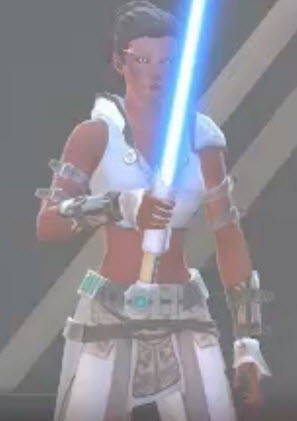 Q: any plans to allow characters to use weapons not intended for their class – like cosmetic weapons A: we will address that in heroic abilities – you get very iconic abilities specific for that class you have unlocked. Cosmetic weapons might be a possibility in future legacy development. Q: I want barbershop, can I get them with legacy? unlock more cosmetic slots? A: that is something in the works but something you won’t be able to see for a while. Different cosmetic slots are even more further back. Q: Alt: those buffs from other classes, are those self only or apply to all group members? Does that mean we don’t need to bring a specific class for ops/warzones? A; yes. Q: Shared bank between your alts? A: Legacy bank is on the table – its behind guild bank. we are pro-legacy bank. In 1.2 we will allow you to send cross-faction mails. Q: more character slots? A; no plans at the moment but suggestion is noted. Q: class quests are unique but stuff like solo planetary quests – can we bypass them? A: yes we will give you specific buffs that rewards for doing specific activities – i.e. bonus xp for doing class content. This is coming in patch 1.3. Q: will buffs from different factions stack? i.e. will Sith warrior and Jedi knight buffs stack? A; they won’t stack but you can use them cross faction. 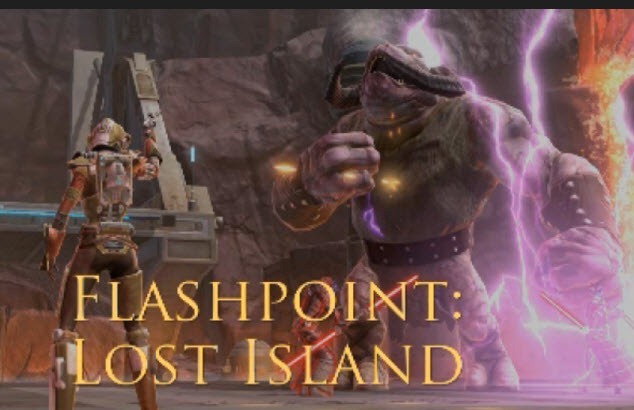 Q: endgame flashpoint/operation loots being bind to legacy to extend the farming of your flashpoints/operations? A: No current plans – but there is an inherent flexibility gearing up your alts via extract mods/crafting. No plans to handling out the specific BoP items to your other characters. We will give you one huge quest that unlock rewards for all your chars if you complete it (coming in 1.3, 1.4). Q: dual spec in the legacy system? A: more than dual spec, multi-spec is coming. It is tied to the legacy system. not coming with 1.2 – at first allow you to save different specs but in later patches you can save gear layouts. Q: plans to allow rename/legacy system? A: we don’t have an automated system in place right now, maybe something in the works soon. Right now you will have to contact a CSR. Q: any plan to give some sort of crafting advantage through the legacy system? A: we love it but there might be balancing issues. We are opening up our crafting system with 1.2 – we want crafting to be more BOE and less BOP. Not in 1.2 but shop droids have specific cores you can purchase from the repair droid that improve specific crafting skills. You also build affection with your ship droid and we put a voice restraining bolt on the droid (huge cheering from the audience). Q: can you put your companions into your family tree? A: not right now. Q: cosmetic ship upgrades from legacy? A: yes cosmetic ship upgrades in the future but may not be tied to legacy. Its quite aways down the road. Q: how can an agent use a force ability? A: force using potential goes strong in your family line – you just need someone in your family line that can use force powers. Q: how will heroic moment abilities affect open world PVP where companions can be used? A: right now you can do it and that is all I can say about that. Open world PVP is the wild west – anything is possible. Objective based areas like Ilum do not allow companions. Maybe you can solo hardmode flashpoints with your companions using heroic abilities. Bioanalysis seems like a good money-maker – low popularity but high demand from biochem. Wealth distribution for level 50 chars – 80% of level 50s have less than 400k credits. . chart ends at 10 million – less than 1% have 10 million. With patch 1.1.5 we introduced some content for rich people – encourage them to let go of their credits. Credit sinks: majority of credits spent – ability training – this drops off around Feb as more and more people are 50. Other sinks like container purchases now take over. Relative wealth- this is the discrepancy between sources and sinks: the actual inflation rate we have right now is around 12% – it is not too bad. People are saving up in anticipation of new stuff like legacy. Faction selection distribution – 57% empire to 42% republic across all servers (they mentioned my population study I posted on Reddit hehe). More empire players on PVP servers. With cross-server warzones we can equalize a lot of the faction imbalances. Gender selection of characters: 70% male, 30% female. 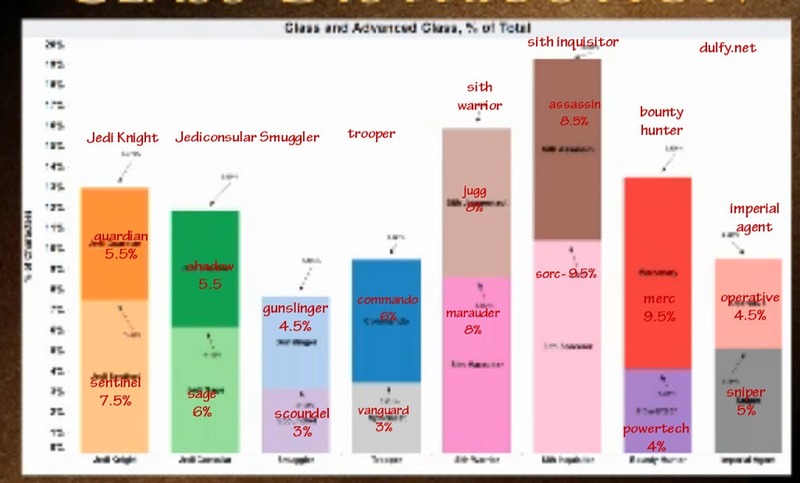 Class distribution:: Sith Inq is the most popular class, smuggler/IA are very low numbers. In alpha testing Jedi Knight was the most popular class. Short of making the class really OP there isn’t much we can do. It can get a bit lightning heavy in warzones.The class distribution you see here is not because one class is overpowered but rather part of pre-conceived start wars fantasy. 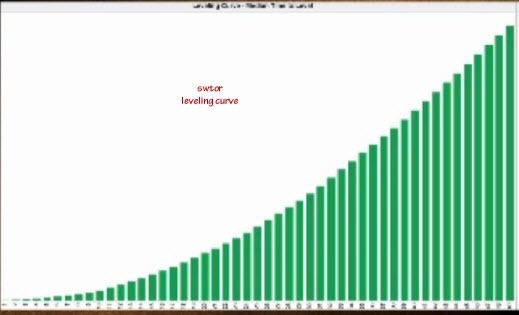 Leveling curve: time to level – very smooth curve. there is no big gaps or gaps around 40 or something. Our target time for 50 – you guys nailed that in terms of game hours played (can’t tell you how much that is). Real time to level 50- you guys blew past that as you guys play too much! we have seen some insane play hrs in early access (some even to superhuman levels). Top 25 products based by sales volume: desh rank the highest. Products ranked by sale price: crafters at the top end of our gear progression are making a killing – almost all of the stuff sold is rakata or rank 25 mods/enhancements/armoring. 84% of our players have less than 1 million credits. Repair costs seem a bit too high – currently we can’t change it but when 1.2 goes live (has more money sinks) we may adjust it if necessary. Exploits: Ilum chest looting fixed in 1.2 – if you show up with a lot of credits we will track your activity. we have a team of 30 people to get rid of people that credit spam – they get banned as soon they show up. We can track all credit transfers. See a spammer, report it, fastest way to get them banned. crew skill missions is the #2 moneysink. Not every crewskill is viable for endgame – only biochem currently is. Coming up in 1.2 – legacy upgrades – improve C2-N2/Rv-N8 crafting abilities with equipment. Reverse engineering received a major overhaul– better rates and you can reverse eng more items – we made it a lot more useful. Endgame mods from reverse engineering. You can craft operation gear with critical augments. Slicing – will be become the source of augment materials. Cybertech speeders will become BoE (Bind on Equip). Changed prices on speeders – you are now paying less for tier 3 speeder training but cool looking mounts – expect to pay more. Cybertech grenades – shorter cooldowns. Artifice – new color crystals and it is the first profession to gain our PvP crafting – gain mats and schematics from doing PvP and purchasing bags. 5 page of patch notes for crew skill – a blog released soon! Q: expensive to remove 25 mods but if you can make those mods, shouldn’t it be cheaper for you? A: not for 1.2, we will look into it. Q: I pvp, my gear never breaks, add repair cost to pvp? A: maybe – riot in the audience. Yes we are aware of the discrepancy PvE and PvP gear repair costs. 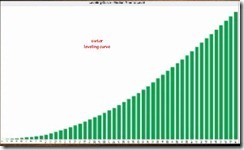 Net income between PvPers and PvEers are actually about the same. Q: I can get armoring crew skills to make rakata equipment and then dismiss that crew skill and learn biochem and still wear my Rakata items. On the other hand, if I learn Biochem first, make a rakata stim and then learn synthweaving or anything else – I can’t use the reuseable stim anymore. A: Reuseable stims wil be phased out over time – they will not be upgraded in the future. Q: Exotech stims – the epic materials are very hard to get and produce (from highest level of diplomacy missions) – any plans to change that? A: Bioanalyis is very low and there are a lot more biochems – so there is a huge inflation on bioanalysis materials. Not much we can do about that – supply and demand will take care of it by itself. Q: Cybertech healer – can I get kolto grenade? A: It’s a good idea. Q: Contract system for crafting – request to have something made? A: yes it is on the wall of crazy, not immediate concern but its in the works. probably some day. Q: Some clothing options look slightly different color on different classes? A: some items look different between republic and empire – this is an intentional feature to preserve some faction identity. in terms of color – what you said is not something we have seen, can you send us a screenshots? Q: Crafting gear better than endgame pvp/pve? A: yes it is better but it is more work since you have to extract mods from endgame gear and get a critted orange gear made. Also losing the restrictions on some of the operation mat drops to help out crafters. We are going to bring out crafting to its full glory – crafting is fully supported on all patches. Q: 1. Phasing out reuseables – how far is it to make every crew skill to be viable in game? 2. RE chance at end-game level, is it worth the risk? A: 1.2 will have a tooltip that can tell you if you can RE something and get something out of it. We also increase the gains from RE and removing the duplicates out of the RE system so you don’t re-learn the same schematic. In terms of reuseables – we are really bootstrapping the augment economy with this patch so phasing out reuseables is not a concern at this point. Q: Any plans for longer crew skills missions – 16 hr missions for epic stuff or greater returns A: we like the idea too – incentive to log on at least once a day. Q: any plans to add crafting daily to give people option to get high level mats? A: new resource nodes on new content and also on existing high level areas to help you out.Also we will eliminate the BoP restriction on the operation mats. Q: possible to send two companions to send on the same mission to reduce the time: A: not possible right now. With 1.2 expensive missions you brought from GTN are no longer failable. Chat bubbles – we used to have chat bubbles in the game but it dragged the performance of the game down so we had to remove it – we believe we have fixed this issue so you should see this feature pretty soon. Improving spawning techs – these are NPCs that you can’t click on – they will increase or decrease depending on your system – we will populated the more empty areas. More ambient creatures, more moving parts everywhere. Q/A & suggestions from audience. Suggestion: clothing restricted not restricted by class (i.e. 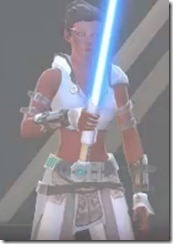 Jedi sage can’t wear something because it is medium armor) A: in the future all cosmetic gear will work for all types and we wll get a ton more of it. Suggestion: custom-emotes enabled cross-faction, perhaps reduce the say range in the absence of chat bubbles. Q: re-enter class quest areas to RP? A: no, but we will give you some good, interesting straight RP space in the future. Q: people with un-RP legacy names – i.e. dudeofthebro legacy, any chance for tighter RP naming policies? A: What about more ways to adjust what you see in other people’s nameplates. Can’t really restrict naming rules – Star wars is a modern setting and people have weird names. Suggestion: more variety of ambient content (i.e. those little plays you see in cities) in populated areas as these tend to get stale pretty quickly (i.e. maybe a day/night cycle). Suggestion: Squad inside a guild system – like a guild inside a guild for people that don’t want to leave their old guild? A: why can’t you do it with private chat channels? Suggestion: cut/paste chat lines to our forums to allow RP off the game. Q: legacy system- can my legacy characters be not blood-related? A: Yes people in your legacy can be allies etc, does not have to be in a family. Suggestion: I like some of the lines my characters say in cinematics – any emotes that can repeat some of our character lines? A: yes absolutely – more RP emotes and emotes with character lines. Suggestion: companion ride along with taxis – ride shotgun – A: we had something like this before, but M1-4x came along. Suggestion: name a companion for RP purposes. Suggestion: /ignore someone turn off their nameplates too. A: we love it – good solution to people with weird legacy names. Suggestion: I don’t like a companion, can I kick him/her out? A: No, we originally allow you to kill companions – people thought this was fun and abused it – kill off all their companions and got mad (huge nightmare for the CSRs). What about a social item to temporarily carbonize your companion? Q/suggestion: will we see a possibility of a 2 seater mount? A: we would love to but it is wayyy down the road. You will ride a tauntaun mount first. We think guilds are very important to us and we have a roadmap for improving the guild experience. Guild UI is functional but could use more features – although we still consider it a qualified success. Guilds want tools to make coordinate easier and ways to show off their epeen. We have good logging in the backend for CSRs to have a clear idea of what happened. You can repair using guild funds. We also included a separate log for credit transactions allowing a 2 week view of all credit transactions. Guild emblems – show off your guild on your armor. it’s a toggle on/off and show on certain hotspots. Guild advertising – make it easies for players to find & join your guild. Q: what kind of guild UI improvements do you have planned? Maybe fixing mouse scroll in guild UI and allow you to invite people to groups from guild UI? A: we are going to fix both of those – not sure when but probably 1.2 – we are also going on a more global cleanup of the guild window in a patch after 1.2. Q: look at guild list and check people’s crafting skills A: happening sometime after patch 1.2 but definitely on top of the list. Q: plan for a tax system? A: that is in category of well – duh moments. ya I just realized we didn’t have it – we will get it in now that we have a guild bank. no ETA. Q: Off-game approval/recruitment of guild members like we had it pre-launch? A: maybe, but its a lot of work – too much stuff to do – if you frontload all the easy features the big features never gets introduced. Q: Concept of uild rivals – queue warzones with your guild rivals or if you see them in open world, automatically turn on pvp flags?A: we talked about it earlier in the PVP section. Q: invite people to groups from guild list? A: its done in 1.2 – if not we will code it in now. Q: able to see if someone is grouped in guild window and change colors if the group is already full? A: interesting idea, I will write it down. Edit mode: (blue) UI elements that are not always active; you can move things anywhere you want. (red) are UI elements that is turned off. You can move everything on your screen where-ever you want and scale each UI element individually or you can scale all UI elements at once. Still nnly 4 quickslot bars – still working on it to add an additional quickslot bar in the future. You can save your UI setups as a XML file and share it with other people. Q: Click to cast for healers? % bars for target of target or focus targets? A: Health % is in target of target. Click to cast is not in 1.2, maybe in 1.3 –1.4. In terms of target of target – you can see your primary’s target’s target of target and also your party member’s target of target even if you use ops frame in party. Unfortunately ops target of target is not in 1.2 but will be in later patches. Q: any simple macros? A: its on the list, no eta. No macros that affect combat directly. We don’t want a higher barrier of entry to combat. Mouse over healing is not considered as a macro. Q: buffs and debuffs – too small right now and I can’t see – are those icons are resizable individually A: they are not in this build, if you scale your ops frame you can increase the size of the icons. We also want checkboxes that you can check to see only the debuffs and buffs you want to see – this is coming after 1.2. Q: Powerauras from WoW? Icons that pop up on your screen to let you know if you have a proc A: we want that – we don’t want you stare down at your buttons. In 1.2 a lot of abilities have proper sound cues to help with that as well. Q: A way to differentiate between icons/buffs to know what is active and what is not? A: yes, we are polishing to get an identify of the UI across the board. Q: A way to differenate between my debuffs/dots on a mob and someone else’s debuffs/dots A: we want to allow you select what debuffs/buffs you want to show with checkboxes/different colors . Yes but long term. Q: I don’t have enough quickbars for my abilities – can you streamline abilities? A: maybe macros? we need to do more exploration, we need to get another quickbar in term (not in 1.2). Multi-spec will bring spec specific quickslots. Q: companion bars don’t pop over your bars A: yes, it is considered its own bar now. Q: Auction house UI change? A:Yes coming with 1.2 you will be a lot happier, can’t tell you details. Its 80% less stupid to post and buy stuff from the GTN. Q: A way to save keybind profiles between different characters? A: not part of 1.2, its on the roadmap. Q: API to develop mods? A: its in planning stage, its very complicated, we want to ensure its fair and balanced. its something we will work on, its a lot of work so there is no ETA. Q: Is there going to be a stealth bar for stealth using classes? 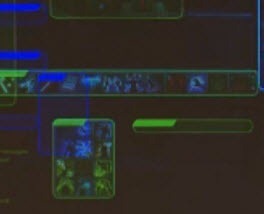 A: Originally we had a stealth bar similar to the cover bar. Sadly there isn’t a lot of many abilities that benefits from it so we turn it off. If we see increased demand for it we will put it up. 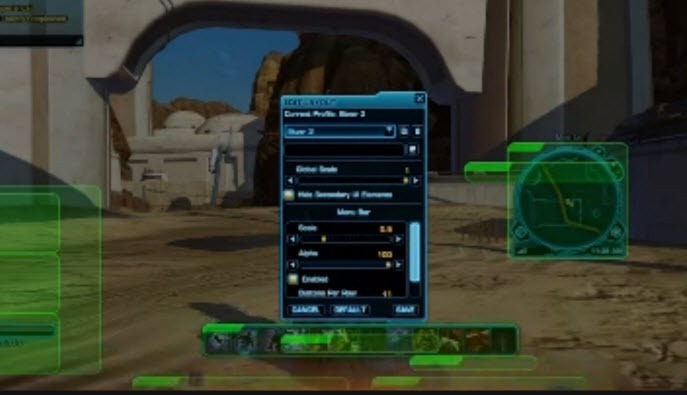 Q: Any plans on skinning the UI for different colors for visually impaired/color blind people or going with empire red/republic blue? A: A design document for color blinded people is being passed around and it’s a priority for us. However, doing a full skinning of the UI for color is not a priority in the near future. Unify to chest option is back – it was a beta feature. Gear can be toggled on/off individually for this feature. It is not going to be same color – but a color that fits the theme. Higher resolution textures available. I can has “advertising mode”? Yes you can. Dual/mutlispecs – coming in 2 parts –1st part allow switch between skill trees, 2nd part switching changes to gear loadouts as well. Q: At level 50, bonus quests only offer you legacy xp – can you turn the old xp you used to get pre-50 into credits or other type of rewards. A: we had it in beta, it will depends on the current economy – we don’t want to generate too much cash. Q: Nightmare mode for new ops, different mechanics or just additional health? A: Additional mechanics and different rewards – hence why it is arriving after 1.2. Hardmorde and nightmare mode will be the way to gear up. Raiding used to be just in normal mode & hardmode and nightmare is just something you do for the titles/mounts. However, this is being changed in 1.2 with the raiding being shifted to hardmode/nightmare mode (with the nightmare mode being a true “nightmare”) and story mode is just for the story (not really the place to gear up). Q: Cross server/faction communication & cross-server guild alliance? A: Cross server communication is down the road a bit. Cross faction communication – Damion was against it initially but with a legacy system that encourage you to play both factions it might be possible with adversaries. Q: Can guild leader assign someone else to change rank functions/access to guild bank in case they are away? A: Only guild leader can set ranks, restrict access etc right now. Q: BHs/trooper ever going to get a battle rez? A: NO in the short-term. Q: server balance – 57% empire, 42% Republic – my server is a ghost town on the Republic side. A: what if we put in a system that encourage people to play the other side? We think that will help. We are hoping the legacy will help with that. No server transfers right now, maybe further down the line. Legacy is too complicated to allow server transfer. Our faction disparity is actually not too bad right now. 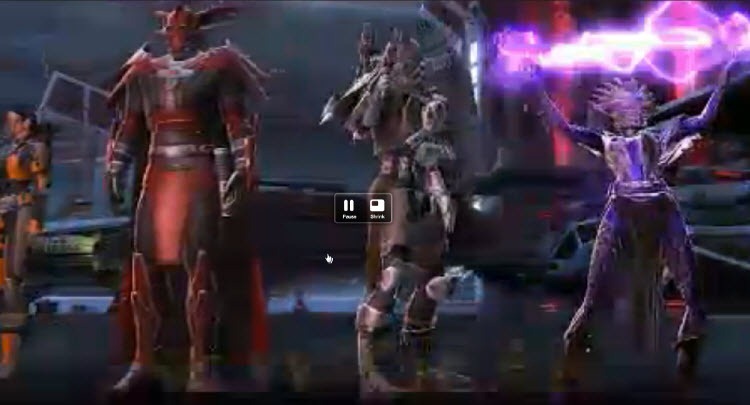 Q: cooler outfits for republic characters in endgame progression? A: we will take a look at it and try. Q: Legacy system encourage people to play both factions- you are splitting our guilds who are playing on only one side. A: Maybe we need to allow you to create sister guilds via the adversaries program on the others-side and ensure that the legacy system isn’t destructive to the community. In the future – account wide/legacy friends – people have the ability to hide from this option as well. Q: Legacy abilities – these abilities are faction specific? A: Yes, force choke only specific to sith warriors for example and you need to level that rather than a jedi knight to get that ability. 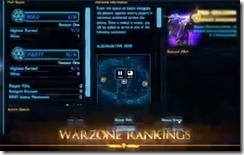 Q: PVP warzones – some warzones are not 8vs8, can you fix that? A: we have incentives in 1.2 to reduce people leaving warzones and some optimization to the matchmaking system to fill in people who have left. Q: Any updates on same gender romance? A: its coming with story updates sometime this year. It wil depend on our writers. When we do this, we don’t want just change the dialogue to the other gender. We want new romance arcs – it ended being a budget and scheduling issue etc. Its coming when full story comes. which is this year. Q: No incentive to go back to older planets – add daily hubs to older planets? A: dynamic events team will cover this and likely make some unpopulated area more populated. Q: option to turn off environmental effects – smoke/clouds? 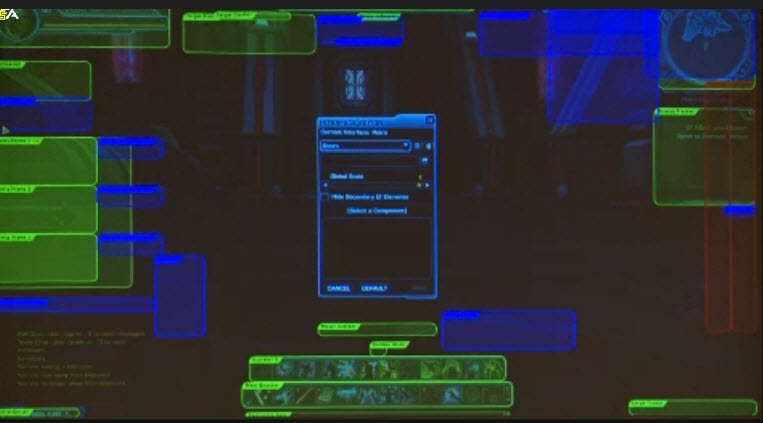 A: yes we have an entire team dedicated to make swtor run on low-end machines (i.e. laptop) but no macs. 1.1.5 have updated shader setting for very low spec machines (you can run the game on a machine below the minimum spec now). We are also aware of issues on high-end machines and the work the team is doing on low-end machines will benefit all machines across the board. Q: Epic weapons/armor quests that involved multiple operations/flashpoints?.A: not in 1.2, but it is coming. You may even need characters on both factions to do them! 3.8 million character’s created? I think most people have lots of alts. if people have 6 alts each, then that is around 3.8/6 = .63 million subs. lol I didn’t hear any but i boo’ed lol was hoping for march.. I thought the crafting system was getting some sort of overhaul. Where’s the info on that? New schematics and extractable mods don’t sound like much. If anyone gets a chance, can they ask them to add opacity levels to the chat box? I have partial color blindness and poor vision…and I get huge headaches from not being able to darken the area behind the brightly colored text. I’ve tried changing text colors and it helps to a degree, but being able to just add a layer to separate the scenery in the background from the text I’m trying to read would be a huge help. As a roleplayer, most of the time my eyes are on my chat box! I think it would go best under “UI” discussion. There’s actually already a full-opacity setting there, the problem is the background color is grey-scaled, so I’m guessing for someone with color-blindness that doesn’t work so well, white text on grey. What you’d actually want is a contrast setting, or at the very least the ability to set the background color of the chat window to your choice. I know that’s something I’d like, because while I’m not color-blind, I still have trouble seeing some of the different chat colors due to poor contrast. Scratch that, I forgot they made the background semi-transparent even at full opacity setting (aka chat panel alpha). Still, a chat panel contrast setting would be a huge help. Dulfy, just wanted to say thanks for the great synopsis, really appreciate all your hard work and the update on Guild Summit. , If only I enjoyed playing a healer than I could really take advantage of your awesome guides, but then a awesome healer needs tanks and dps to heal. Dulfy, you’ve done such a phenomenal job with this! My metaphorical hat is off! 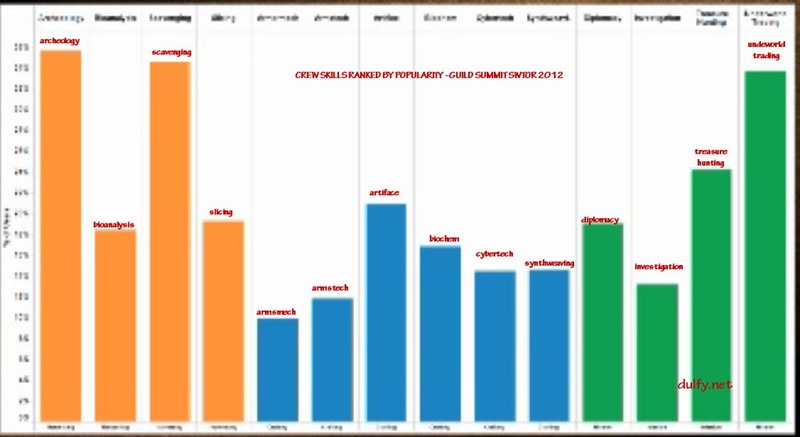 Seriously, this is above and beyond anything I could have expected from a live blog covering the guild-summit. At first I was disappointed that I couldn’t attend in person, and couldn’t watch the stream due to working away from a computer, but this is actually better in a lot of ways (at least as far as clarity and permanence of information is concerned). Amazing work here! Cant’t wait to see this stuff put in game, thank you Dulfy!! Thank you for the writeup. I was wondering if anyone had notes, as I was not able to be on for the live stream. Most impressive job OP, I thank you very nuch for this. Really. Wow, this is really impressive, and I learned so much about what’s coming from reading this! Thank you for taking the time to document and post all this, it was certainly a lot of effort, and is appreciated! Great post , i found this a very useful read . You all forgot one of the most important feature requests. Please. And I am begging here, allow us to turn off the dialog box and the verbal commentary of our companions when they finish a mission. The dialog box takes up almost half of the screen and requires me to click my only real choice which is accept. Why bother with a dialog that has but one choice? Just have it auto accept and not disturb my flashpoint with the mind numbing verbal responses and dialog box. Chiss isn’t a new race, barring the level 50 unlock for all classes. 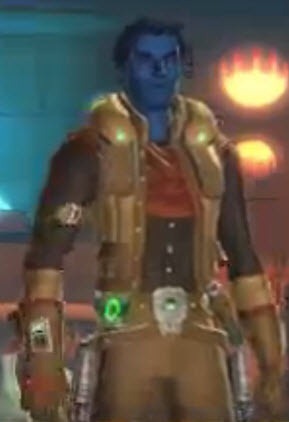 Is an actual new race being unlocked, or will Chiss be enabled for more classes even before hitting level 50 with one? Server balance…Don’t know if it’s like this across the board, but my server is Imperial heavy. When I joined about 2 months ago my server was light populated, I thought cool lets start somewhere fresh and make a name for myself eventually the server will fill up… Lately I’ve been waiting for around 3-4 hours just for one pvp queue. On average we have about 15 people on the fleet. Finding pugs for lvl 50 flashpoints is non existent and the guys who were consistently PvPing and PvEing are rerolling on different servers ( just lost ten good players to another server). Right now I’m a lvl 50 Battle Master.. We lose about 90% of warzones, the Imps are actually starting to let us win a few just so we will keep queueing. One of the main reasons for this is that we are always out numbered it is very rare that we have a full 8 man grp for wzs. The talk in genreal chat is only about our server dying and where to reroll and when will transfers be open. If transfers do open it might make it worse since most people would be leaving and not coming. My suggestion would be to merge some of the light populated servers so people won’t stop playing or atleast create a cross realm LFG system for FPs and WZs. Out of all the problems with this game I think this is the worst. I made a Jedi Sentinel and put in a lot of hard work and time and I kinda feel like it was for nothing because it is so hard to find something to do when you hit 50 on my server other than dailies… In no way do I mean to “diss” the game.. I love it, there is not another game out that I have more fun playing and I play them all or atleast I used to until this game came out. I would love to reroll, which I think is something they obviously want to encourage, but I want to stay with my guild and unless the 10 core people all decide to reroll on a different server I dont see that happening. Hopefully it wont always be like this. My username is Gio and I’m from the server Thendy’s Noori. Only thing I got against this post is the poor quality pictures, and how there mostly all blurry other than that great post!